England qualified unbeaten for each World Cup from 1950 to 1962 (and then automatically for the two after that), with their one real moment of worry coming in their last qualifier for the 1958 World Cup. Just 11 days after England had won 5-1 at home to the Republic of Ireland and more than a year before the finals, the sides met again in Dublin with Walter Winterbottom’s team needing a point to clinch qualification. If England lost, then they would have to face their opponents again in a play-off provided the Irish beat Denmark (considered a weak side at the time). 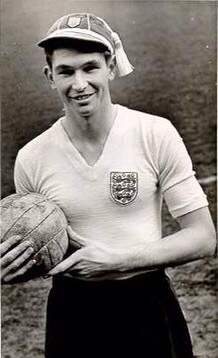 John Atyeo’s late goal took England through to the 1958 World Cup, but he would never appear for them again. A match that will never be forgotten and still crops up in discussion more than 40 years later. When England failed to qualify for the World Cup in 1978 and 1994 they went into the last match still in with a shout but with matters out of their hands, with fortune not on their side as they missed out despite beating Italy and San Marino respectively. But at the climax of qualifying for the 1974 tournament, matters were more straightforward. 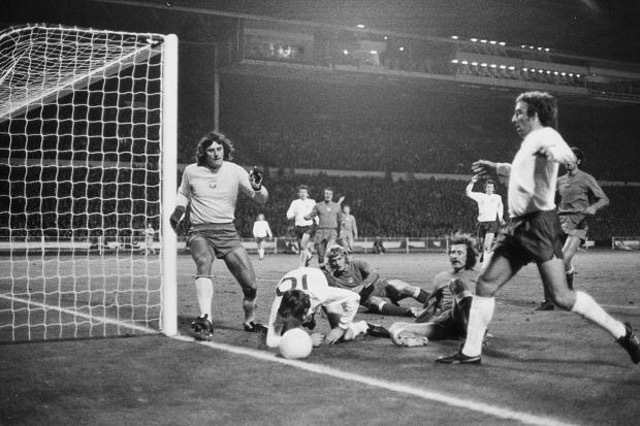 “Win or bust,” said BBC commentator Barry Davies as England welcomed Poland to Wembley in October 1973. The 1966 World Cup winners had to win this match to make the 1974 finals, or the Poles would be the side to make it to West Germany. First was first, second really would be nowhere with no play-offs to offer another shot at getting through. Poland had inflicted England’s first World Cup qualifying defeat four months earlier and were not to be underestimated. An image that sums up the infamous night: England attacking, but not scoring. As has been well-documented, England peppered the Polish goal but a combination of bad luck, Jan Tomaszewski’s heroics – despite being labelled a “clown” by Brian Clough – and Sir Alf Ramsey’s men failing to take chances kept the game goalless. Then the sucker punch was dealt after the break, Norman Hunter and Peter Shilton both taking the blame for Jan Domarski’s breakaway goal to give the Poles the lead. Although Allan Clarke’s penalty restored parity, the winner would not come for England despite creating further chances – with substitute Kevin Hector almost the hero at the death. As the final whistle sounded there was disbelief at Wembley. “One of the blackest days they’ve ever had,” said ITV commentator Hugh Johns as reality bit about England’s failure. They should have won this one, but the Poles would prove they had merited qualification when they excelled to take third spot in the tournament. By then, Ramsey was out of a job. When England took “a hell of a beating” away to Norway in September 1981, it looked like the game was up and they would fail to qualify for a third successive World Cup and potentially be out even before they played their last game at home to Hungary. But then the footballing gods answered ‘Reverend Ron’ Greenwood’s prayers. An unexpected combination of results – most notably main challengers Romania taking one point from two games against Switzerland – meant England now only needed a point at home to the Hungarians, who had already qualified as group winners. But so fraught had England’s qualifying campaign been that nobody was celebrating yet. The game’s importance was such that Wembley was full to its 92,000 night-time capacity and it was being televised live on the BBC – a rarity for home games at the time. Paul Mariner’s goal takes England through to the 1982 World Cup. The nation prepared for a tense night but an early goal by Paul Mariner calmed nerves and the Hungarians rarely looked like they might bail out their Eastern European rivals Romania. England successfully saw the game out and at last they could plan for a summer in Spain. The game itself was perhaps less dramatic and nerve-jangling in the closing stages than most of the others we are recalling today, but it would not be surpassed for sheer relief over qualification being achieved as the crowd at Wembley sang themselves hoarse in the rain. “England are back,” they roared, as England followers felt delight that the Three Lions would finally be present in a World Cup finals. When England visited Poland for their final Italia ’90 qualifier, it seemed more than likely they would make the finals after Terry Butcher’s full-blooded display in Sweden the previous month. To simplify a rather complicated situation they would definitely go through if they avoided defeat in Chorzow. If they lost they would then endure a tense few weeks hoping other results went in their favour to qualify. They had yet to concede a goal in five matches, although Bobby Robson and his side had not totally shaken off the criticism that came their way after flopping during Euro ’88. Failure to qualify would almost certainly spell the end for Robson. England were far from fluent in this game and were reliant on the veteran Shilton, who made amends for his error against the same opponents 16 years earlier with a series of impressive stops. As the clock reached 90 minutes England appeared to have wrapped up the draw they needed to make it to Italy. Then, after 540 minutes of keeping opponents out during the group, they suddenly looked like they were going to concede in stoppage time of the last game as Ryszard Tarasiewicz let fly from outside the area. His strike beat Shilton but cannoned back off the crossbar and away to safety. England’s sigh of relief over that was nothing compared to that breathed once the enormity of the point earned became clear in the weeks that followed. Wins for Sweden (v Poland), Romania (v Denmark) and West Germany (v Wales) would have all conspired to keep England at home as the weakest runner-up from the groups containing four teams had they lost. Considering how fondly remembered Italia ’90 is by England fans, it’s amazing to think just how close they came to not even qualifying for it. Eight years to the night of England getting the draw required in Poland, they again needed to stand firm to make the finals as they faced a showdown with Italy in Rome. Although the Italians had won at Wembley in February, England had shown greater consistency during the qualifying campaign to hold top spot ahead of the decisive final qualifier. If England avoided defeat they were through, if they lost they would be in the play-offs. It was Glenn Hoddle’s biggest test since taking over as boss the previous year, taking on proven opposition in a frenzied atmosphere. 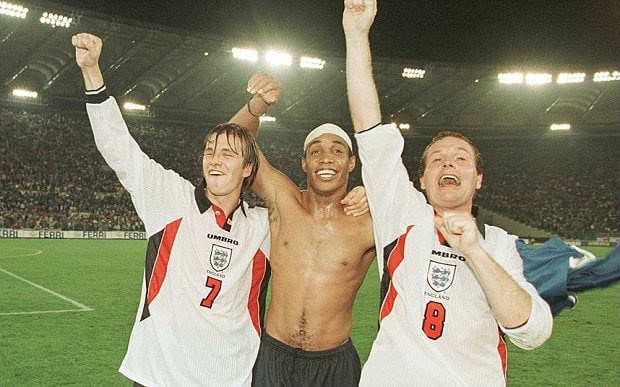 David Beckham, Paul Ince and Paul Gascoigne celebrate in Rome. England gave a disciplined display that is still fondly remembered 20 years later, withstanding the Italian threat and at times looking like they could win it themselves. Never more so than in stoppage time, as Ian Wright struck the post after chasing down the Italian defence. It would have capped the night but suddenly Italy – down to 10 men after Angelo de Livio received a second yellow card – broke forward and for once managed to carve out a clear opening. Time stood still as the ball was crossed for Christian Vieri, who headed across goal and inches wide. It was the last chance and seconds later Hoddle could celebrate his crowning glory. Wright sank to his knees in joy, but fate would lead to him missing out on yet another major tournament. The night also really marked the last international hurrah for Paul Gascoigne, back in the city he graced with Lazio, while midfield colleague Paul Ince led by example as he played on with his head bandaged up. It really was a night to remember. Following Sven-Goran Eriksson’s arrival, England had been unstoppable and recovered from a poor start in the group to lead it with a game to play. Now they simply had to win at home to a Greece side who were already out of the running, or match whatever Germany’s result was at home to Finland. But England, fielding Nigel Martyn in goal in David Seaman’s absence, endured an afternoon of struggle on a day when the Greeks gave an early inkling of what they would go on to astonishingly achieve during Euro 2004. Greece twice took the lead, with substitute Teddy Sheringham’s goal seconds after coming on only briefly levelling matters. 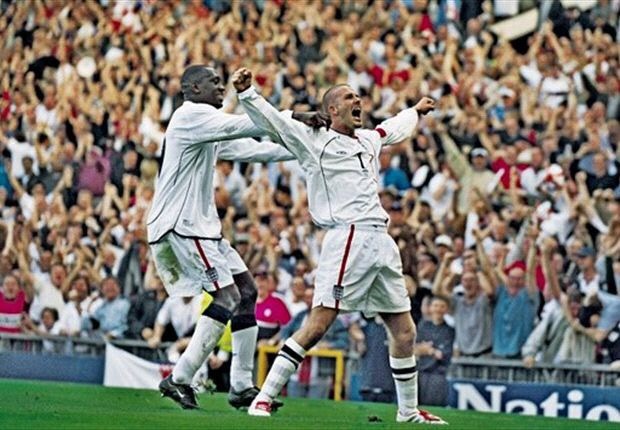 David Beckham’s free-kick clinches England’s World Cup finals place in the dying seconds. England seemed destined to have to settle for a play-off spot, but there was one glimmer of hope. Germany were being held by Finland, meaning that a draw would be sufficient for England to claim top spot. The ending would be unforgettable, David Beckham’s free-kick levelling matters and sending Eriksson’s side through. It had hardly been a performance or result to savour, but the manner in which qualification was clinched brought wild celebrations at Old Trafford. “It’s a fantastic ending to a very poor performance,” proclaimed BBC commentator John Motson. Since then England have made lighter work of qualifying for World Cups, wrapping up their place before the final game for the 2006 and 2010 tournaments and getting the win they needed at home to Poland to top the qualifying group for the 2014 World Cup.